TPMS stands for Tyre Pressure Monitoring System and EU Legislation will require all newly approved vehicles to be fitted with TPMS as standard from November 2012. From 2012 onwards TPMS will also become part of the MOT road worthiness test. TPMS technology has been around for some time in many French and some higher specification vehicles, utilising sensors fitted on your wheels or your ABS system and reporting tyre pressure issues to the vehicle dashboard or an alternative onboard display (eg. Integrated Sat-Nav display. Why do I need to SERVICE TPMS sensors? Tyre pressure sensors are relatively expensive pieces of technology where tyres are concerned, in some instances, costing £100 per unit. A simple and considerably cheaper solution is to keep the valve in good condition through servicing, replacing the old components with a brand new set. This procedure is considered a standard requirement by all sensor and most vehicle manufacturers. Why do I need to replace TPMS sensors? 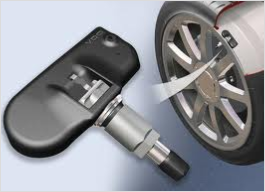 TPMS Sensors generally require replacement once the internal battery has died. This usually takes anything between 3 & 7 years, or around 100k - 150k miles and is dependant upon use and can be effected by environmental conditions. Unfortunately, due to incorrect handling or neglect of servicing, sensors and sensor components can also break which in some cases may require a complete sensor replacement. What is an Electronic Reset Charge? On all pressure monitoring systems, new sensors need to be paired to the vehicles Engine Control Unit (ECU). This is to ensure that YOUR vehicle is communicating with YOUR sensors, recording and reporting the correct data from YOUR tyres. This process is also a requirement after wheel rotation, as the TPMS sensors need to be relocated within the ECU. With some vehicle manufacturers, particularly French makes, this information has to be electronically programmed into the ECU by the tyre technician after installation. In order to complete this professionally requires specialist electronic equipment and expertise. We work very hard to ensure that any electronic reset charges completed in our sites are priced as competitively as possible. If you have any other questions about TPMS, let us know and our expert staff will be more than happy to assist.